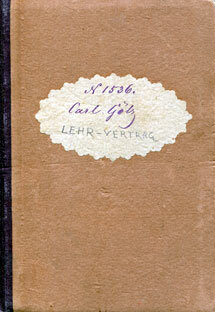 Goetz evidently finished compulsory Volksschule, common school, early as evidenced by his signed Lehrvertrag (Apprenticeship Contract) at age thirteen. 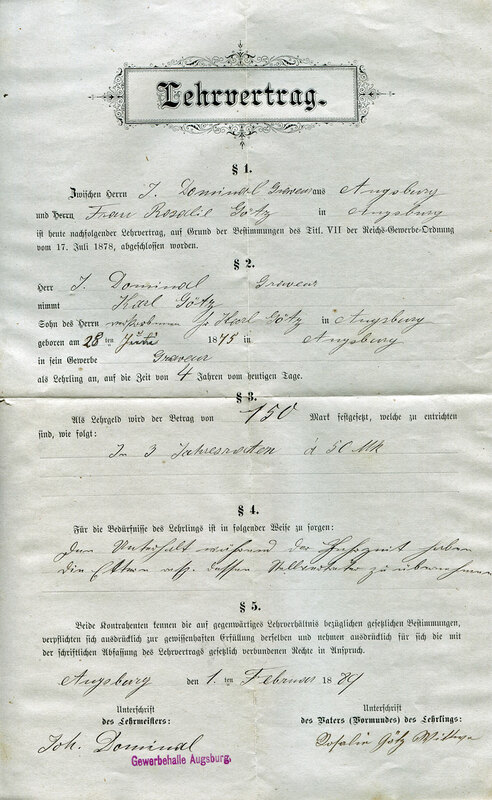 How Karl was originally introduced to Master engraver Johannes Dominal is not evident at this time but documents in our possession show an agreement was drawn up where Dominal would take Karl as an engraving apprentice for a period of four years beginning February 1, 1889. 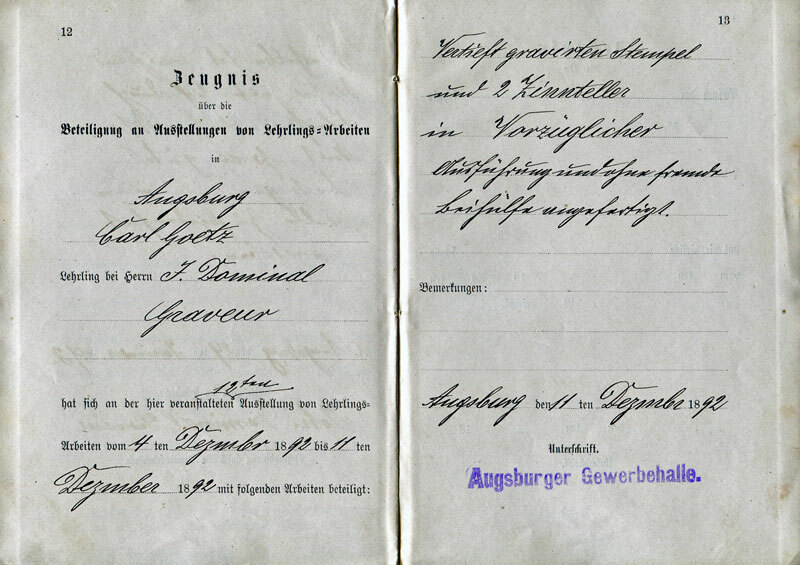 Normally the father of the apprentice was required to sign the Lehrvertrag as the legal representative but his father had died from diptheria seven years earlier. In lieu of the father, the mother would sign but there is little, if any, mention of Karl's mother anywhere. Either she was unwilling, or unable, to sign a contract with substantial mutual service fees attached and payable. 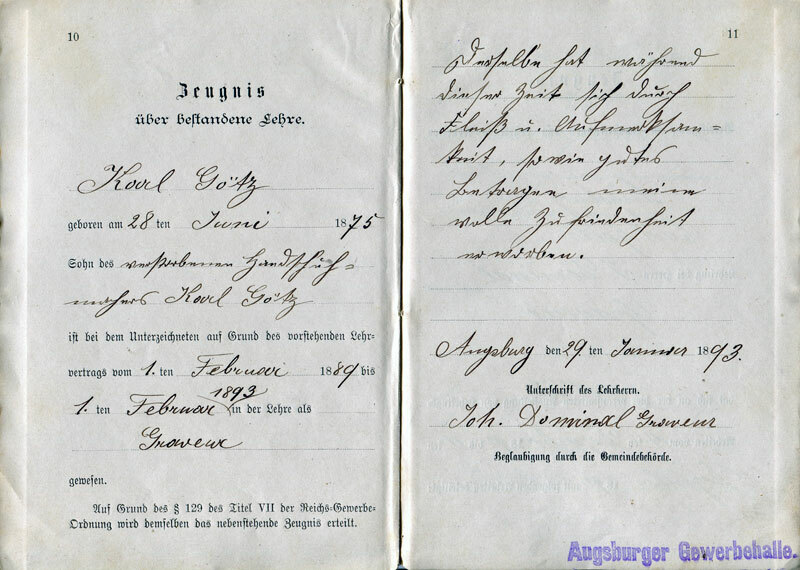 The signee was Karl's grandmother, Frau Rosalie Goetz (§5). As mentioned, a mutual service fee (Lehrgeld, §3) of 150 Marks, paid with 50 Marks down and 50 Marks due each of the following two years, was assessed by Dominal for taking Karl in and to pay for his room and board, furnished tools, laundry, etc., for the period of the contract. Dominal responsibilties were to provide comprehensive instruction for Karl's mastery of engraving, sick insurance, and furnishing materials and ample time for Karl to complete his journeyman pieces prior to the contract expiration. 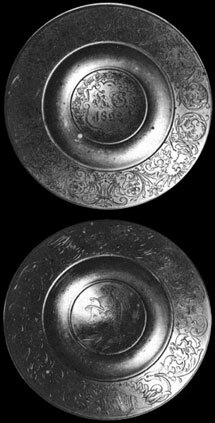 These two tin plates were submitted by Goetz, their completion, submission, and acceptance as proof of handwork proficiency required as part of his journeyman's examination (Gesellenprüfung). The examining commission at the Augsburg Industrial Arts Hall (Augsburger Gewerbehalle) reviewed his work and stamped their approval as proof of his engraving skills and knowledge on December 4, 1892. Passing the exam and handwork submission were the final obstructions to gaining his title as Master Engraver. 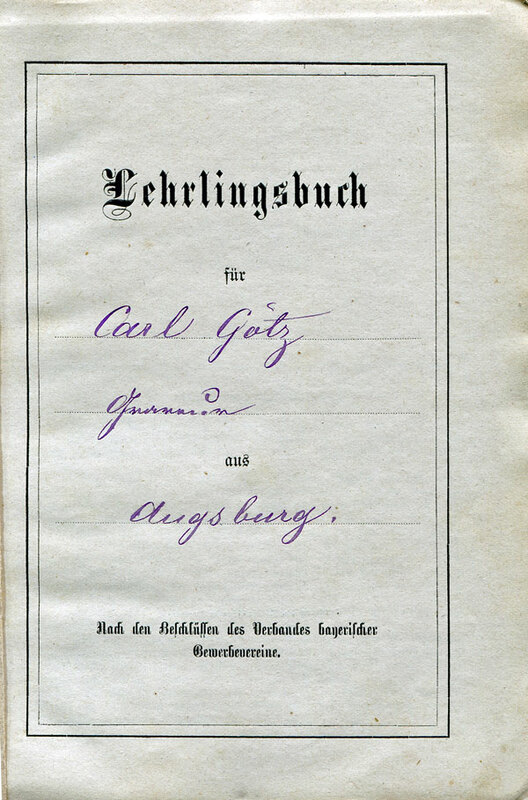 Goetz passed with flying colors and was awarded his Gesellenprüfung. Goetz completed his apprenticeship on January 29, 1893 becoming a journeyman graveur. "My master, Johannes Dominal," said Goetz, "with his great knowledge and expertise in every field of engraving, was my best guarantee for the learning of my trade. I have to thank him for my mastering the negative cut directly into steel." As a young man of sixteen he spent many of his evenings and Sunday afternoons at the apprentice club in Augsburg which was run by it's founder, Monsignor J. M. Friesenegger, who knew how to handle the young men and arrange for activities and entertainment. Goetz was right at home in this club and discovered that he had a talent for the recitation of poems and acting in little lay performances. He enjoyed the applause of the audience, but especially Monsignor Friesenegger's acclaim and encouragement. Many years later in 1929, when modeling a portrait of J. M. Friesenegger for a medal on his 75th birthday (K-423), they reminisced about Goetz's performances 38 years earlier.